This is a Flickr badge showing photos in a set called Personal Favorites. Make your own badge here. I am presently roaming the world with my partner Cherie. 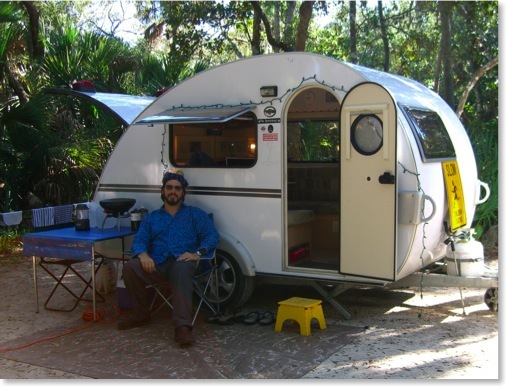 We live together in a small solar-powered camper trailer, looking for adventure and enlightenment. Nomadic Serendipity - I have been living nomadically since April 1st 2006 - roaming North America. This link jumps to my once or twice monthly "major" travel updates, complete with lots of pictures. Nomadness - This link jumps to all the blog entries chronicling my adventures. Paragliding & Paramotoring - When I get the chance, I like to strap a motor to my back, grab the lines of a paraglider wing, and run into the sky. Read about my flying adventures here. International Travel Stories - This link jumps to stories from my international travels, in particular my trip to Costa Rica in September 2005. Burning Man - I have been to Burning Man most years since 1999. I have been inspired beyond words by my experiences on the playa. I share some of my stories and photographs here. Also check out my Burning man photo gallery. Geekery - I am an unrepentant geek, and I even co-host the NPR-affiliated GeekSpeak radio show on occasion. Technology rocks - when it isn’t busy sucking. Weird World - I run across some mighty weird things on occasion. I write about them here.